A few calls for entries to share with all you printmakers! Small Wonders at the Maryland Federation of Art – This small works show is open to printmakers as well as artists working in any other media. The work must be under 11 inches in any dimension, and, unlike our NSW show, this INCLUDES frames. Two entries for $35, and up to four additional entries are allowed for $5 each. There is $1000 in prizes up for grabs, juried by Laura Amussen, Director of Exhibitions and Art Collection Coordinator, Goucher College, Baltimore, MD. The deadline for entries is September 12. Notifications are sent by October 12, and the show is up November 30 – December 28. You can see the full details at their website. 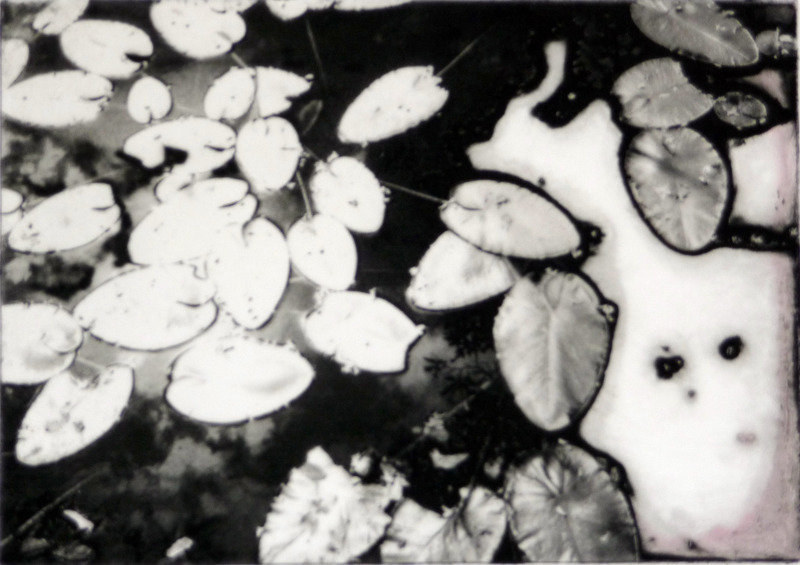 3rd Annual National Monoprint and Monotype Exhibition – The Monotype Guild of New England is seeking monoprints and monotypes for its March exhibition, juried by Mark Pascale, Curator of Drawings and Prints, Art Institute of Chicago. The entry deadline is Monday, October 22 – $35 for up to 3 images. There is a $1000 first prize, $500 second prize, and $300 third prize. Details are on their website. 3rd Annual 17th Street Festival – This festival is held at the end of September, in our old neighborhood of Dupont Circle. Artists interested in a booth (no fee to apply, but the 10×10 space and tent is $100, plus an addt’l $15 for a table and chairs) can apply here. Are you interested in how Marian Osher created the lovely and vibrant prints in this month’s exhibition? Below is a description of the two types of prints in the exhibition as well as a word on how she has protected the works. Images provided courtesy of the Artist. after painting. 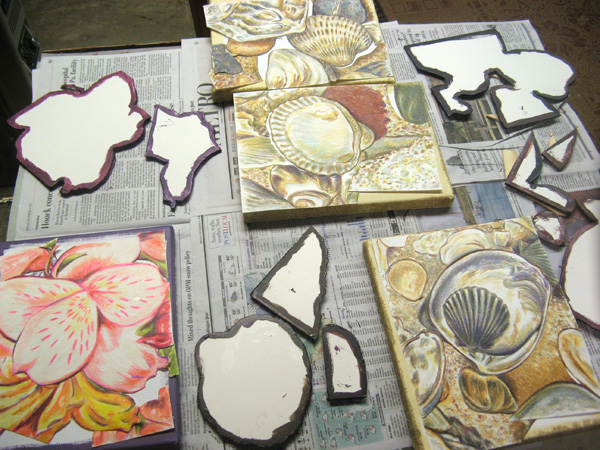 Using Golden Soft Gel Medium, pieces of the print were mounted on the foam board or stretched canvas. The foam board pieces were also mounted on the canvas. Drying the assembled work under weights prevented warping. 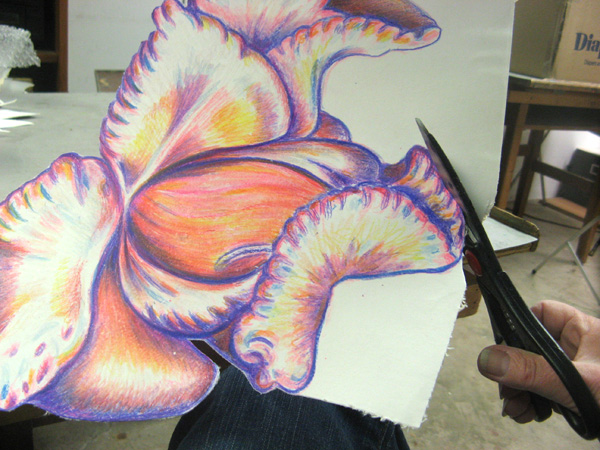 Cutting out the monotype mounted on canvas. dry over night under weights. Flower shapes were cut out, bent and molded to make the relief shapes. 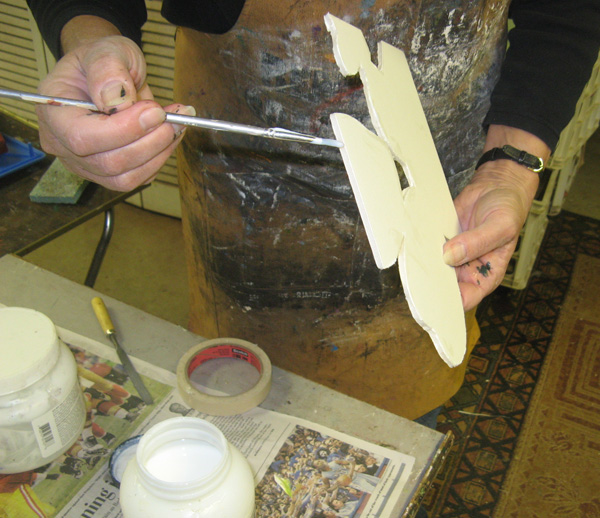 A layer of GAC 400 was applied to the back of the canvas as a stiffening medium to hold the relief shape. This was dried over night with tin foil supports under the raised areas and then “cured or set” with a hair dryer. 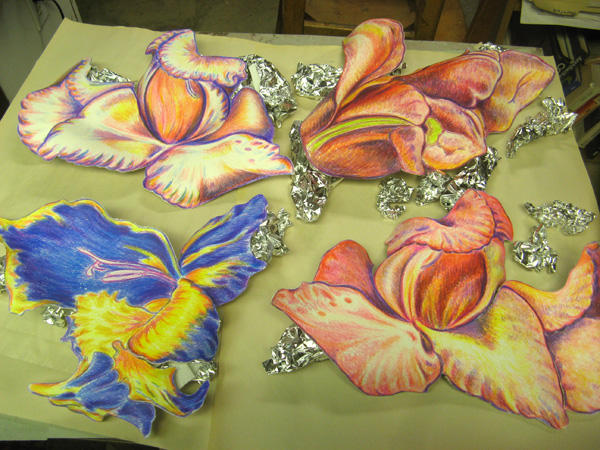 Relief monotypes drying, with aluminum foil "forms" helping to hold their shape. archival process to protect and preserve her artwork. Two of the steps occur after the monotype is printed, flattened and dried. The final four steps of the process are applied after assembly of the artwork on canvas is completed. First I want to say that creative challenges and blocks do not only apply to artists, writers, and musicians. Everyone has creative aspects about their lives and personhood. Early last year I was involved in creating a series of paintings for a solo show scheduled for 2013 in New York. 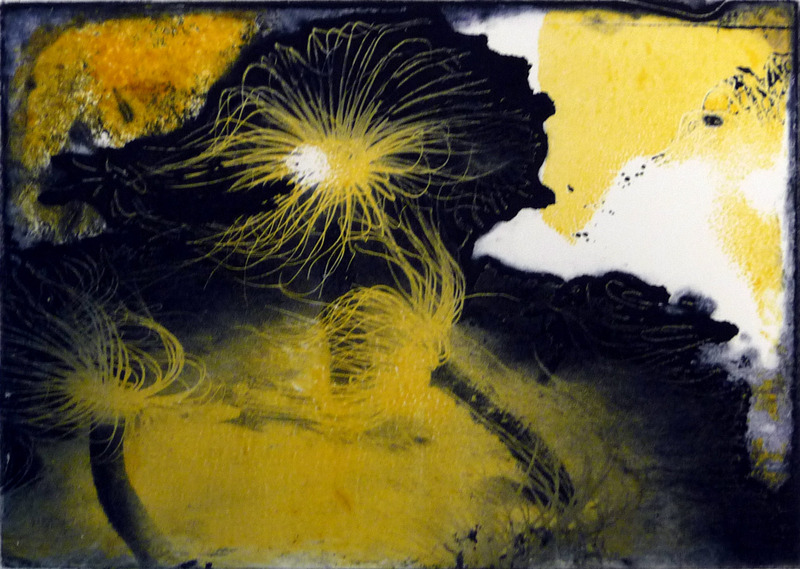 I realized with a shock that I only had 10 months to prepare for the 2012 show at the Printmakers Gallery. I had been thinking about an idea for the show, but no images had come into my mind. The more I thought about what I was going to do, the more my mind was a blank. I began to feel very anxious and even had thoughts that I didn’t want to have this show. The anxiety blossomed into my first major episode of creative block. This would be my 18th solo show. I turned to the internet and found a number of resources (some of the links are on the handout sheet). I found suggestions, cartoons. Everybody had different solutions that worked for them. The most important thing I learned is that creative people experience creative block and they get past it. I also have an extensive art library, which includes many self-help books for artists, some of which I have found to be helpful, which I have also listed on the handout. People get their help in different ways. For me the answer came from yoga. My yoga teacher Mary Jean Eig, to whom I have dedicated this show, taught me the importance of focusing on the breath. You have to breathe slowly and deeply, first in, a short pause and breath out. Then pause again and repeat. It is an important part of the relaxation and oxidizing of the body and one of the benefits of yoga. I realized that creating is like breathing. It’s natural but it can’t be forced or rushed. When I overload my creativity, it’s like hyperventilating. There isn’t enough coming in to allow the creative energy to flow out. This “aha” realization removed the pressure and anxiety. I relaxed and allowed the process to work naturally. And it did. In the past, I have found other ways of overcoming creative challenges. Usually after a long period of intense creative involvement, I take a break and give my artist a rest. I spent a few months organizing 16,000 photos into albums and duplicate files including archiving the negatives. During another break, I organized all of my digital photos beginning in 2000 on my hard drive. You can only imagine how many there are. Another time, I started outdoor sketching. Those sketches led me to a 2nd sketchbook and became an unplanned catalyst for my eyetinerary solo show in 2009. Sometimes I face creative challenges because I have too many ideas or images in my head. I don’t know where to start and that can also be a stumbling block. When I started working on my environmental show Earth Matters, I was overwhelmed by the issues and the choices that I had to make. Frank Wright, my mentor from GW gave me some very good advice: “Just Pick One.” Those three words from an artist and teacher whom I respect, were really helpful. I picked one issue to start with and the other choices fell into place. Then I had my flow. Sometimes creativity gets a jumpstart because something interests me. Like the inspiration that came to me when I saw Cozy Baker’s book about kaleidoscopes. The catalyst for Vibes, my show about images inspired by kaleidoscopes and music. I would like to share some insights about creativity that have worked for me and helped me. I’ve learned to be open to what interests me. Being in touch with what I feel and what moves or troubles me. Being present with who I am and where I am. This awareness helps to open creative my flow. Every month, I go to museums and galleries and I try to see something new that opens my mind to new directions. Not because I want to copy someone’s work, but what I see can be a launch pad for a new way for me to start thinking about my art, moving forwards in new directions or rethinking the media that I choose to work with. Reading artist’s biographies and learning more about the struggles and triumphs of their artistic journeys can provide support, inspiration and empowerment. Most important, as my most recent experience has taught me, is recognizing that there is an ebb and flow of creativity like the waves of the ocean. When we are in an ebb stage, that’s not a bad thing, its part of the regeneration of our creativity. Maybe it’s a time to take a break and focus on our friendships, relationships and other activities, going to galleries, traveling, exploring, and putting new fuel into the creative furnace. Sometimes creativity can be blocked when we have ideas and creative vision just because of the anticipation of the intensity of the creative experience and the energy that it takes to complete a creative endeavor. There is the conscious or unconscious fore knowledge that the involvement will eclipse other aspects of our lives. Like when the novelist is deep in his writing or the composer is completely taken over by his music. Creating is a huge high, but it takes over and takes a lot of energy to follow thru–so before starting the marathon there is anticipation that one might not have the energy to follow thru to take it to the finish. By recognizing these feelings, and the trial and error of creating, there can be an overall belief in the process–that we might take breaks from it, but that doesn’t mean we have lost it–just that creativity is regenerating in its own time, and that is OK. The Kreeger Museum’s exhibition “In Unison, 20 Washington, DC Artists” features monoprints by, you guessed it, 20 Washington, DC artists. This exhibition is the result of efforts by Sam Gilliam, a DC artist who has been associated with the Washington Color School since the 1960’s. Gilliam invited these 20 artists from diverse artistic backgrounds to make five monoprints each. Gilliam and a small board then selected one print from each artist to make the final exhibition. We haven’t been to see this show yet, but it promises to be a good one! The Kreeger Museum is open on Saturday, 10-4 pm, $10 admission, no reservations needed. Reservations are needed Tuesday-Friday. Click on the link above for more information about this show and directions. Exhibition runs through February 26th. "Love, Respect, Protect" by Marian Osher, not in her current "Art Matters" Exhibition, but a great print nonetheless! This weekend WPG member artist Marian Osher will host a reception and artist talk for her exhibition “Art Matters” at the Unitarian Universalist Church of Rockville (100 Welsh Park Drive, Rockville, MD 20850). This exhibition features paintings and prints “created over a 10 year period to combat fear, promote connection and mindfulness, and raise awareness of the importance of living in harmony with the environment.” Read Topher Forhecz review in the Gazette, then attend her reception this Sunday, January 23, 11:30-1:00, exhibition runs through February 6. WPG artist Jenny Freestone also has a solo exhibition up in the Monroe Gallery of the Arts Club of Washington (2017 I Street, NW, Washington, DC 20006). This gallery is closed Sunday and Monday, so try and make it over during their Saturday hours, 10-2 pm. Exhibition runs through January 29. Finally, if you haven’t seen WPG’s current exhibition, “Bewick’s Legacy: Six Contemporary British Wood Engravers,” you should! The exhibition was favorably reviewed this week by Claudia Rousseau for the Gazette. It has also been well received by the public, with 12 of the prints selling already, several of those multiple times over (oh, the joy of editions–if your favorite print has sold, we may be able to get another for you!). This exhibition closes next weekend (Sunday, January 30) so get in here before it’s too late! The following is an excerpt from and article by Pam Schipper on Marian Osher‘s current show of eco-spiritual paintings and prints at Unitarian Universalist Church (details below). The full article, including Marian’s deeply personal experience with flying on 9/11 and the story of how she came to be an artist, can be found in the current issues of Montgomery Life magazine, available in area newsstands now. 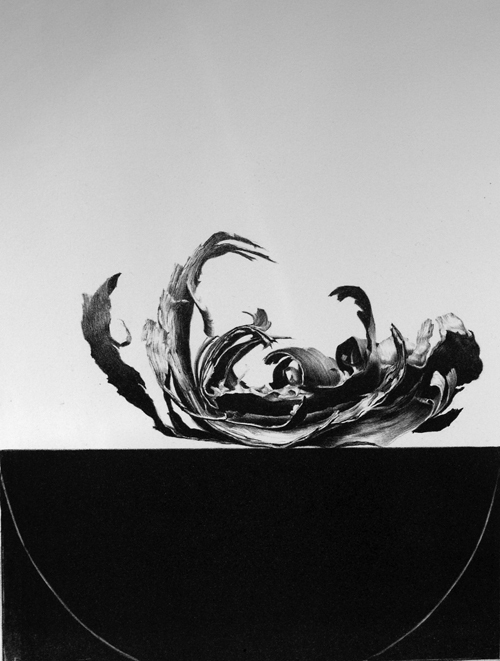 Osher learns something new through each body of work she creates, and she strives to pass this on to the viewer. When her son became a coordinator for the Buffalo Field Campaign, a nonprofit working to protect the free roaming buffalo in Yellowstone National Park, Osher merged her spiritual path with an environmental one. “I would go out there and volunteer. I volunteered 11 times, and I would go on all the patrols,” she says. “Then I did other activism. 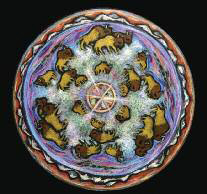 I lobbied with congress, too.” The 2008 “Dream Quest” show at New York City’s Ceres Gallery suspended dream catchers with moving icons over wall hangings of painted buffalo, a craft Osher learned while volunteering at Yellowstone. Images have been reproduced in the Buffalo Field Campaign calendar and other fundraising materials, including note cards, with all proceeds going toward helping the buffalo. “Art Matters” is on display Jan. 9 through Feb. 6, at the Unitarian Universalist Church, 100 Welsh Park Dr., Rockville. Among the 60 pieces are new multimedia works inspired by the seashore. An artist’s reception and talk will be held Jan. 23 from 11:30 a.m. to 1 p.m. Exhibit hours are 10 a.m. to 4 p.m. Monday through Friday, and 11 a.m. to noon on Sunday. For more information, call 301-762-7666.